Large Ship/boat made by Fleischmann,Germany. Large Fleischmann oceanliner. Germany L= 20,5 inch-52 cm. Wind up. Great condition all over. Wonderful old tin plate ship.This tin plate toy is working with clockwork. 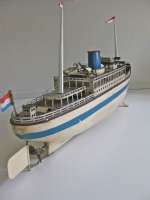 See Richard T.Claus,Toys Ships,American and European nautical Toys from the 19th.and 20th.centuries.Antique Collectors Club,UK 2005. Jacques Milet and Robert Forbes,Toy Boats, 1870-1955,New York 1979. 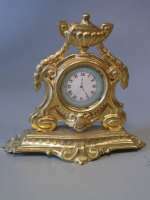 A Fine Ormolu Mantle Clock. Erhard & Söhne.Germany.1880. 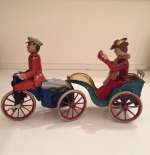 Charming Taxa car with driver made by Meier,Germany. ca 1905. The car features a stern looking victorian father at one window and his wife and child at the other.Very good/excellent condition. Made 1905.L= 3 1/4 inch- 8 cm. See David Pressland,Penny Toys,New Cavendish Books,London 1991. The Toy Seller with Mickey Mouse made by Einfalt,Germany. 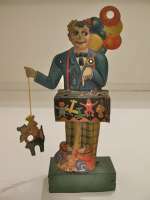 The toy seller made by Einfalt,Nürnberg start 1930s. Working by wind up mechanism. His arm wave up and down. Selling a Mickey Mouse among others things.Excellent condition. Working fine.H= 7 inch - 17 cm. The Anxious Bride NANNI made by Lehmann,Germany.EPL # 470. 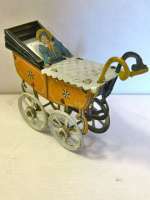 Anxious Bride NANNI made by Lehmann,Brandenburg between 1901 and 1935.An excellent toy in excellent condition and working fine. A wind up Motorcycle transport a carriage behind with a lady. When he drive too fast see rises her arms. Working fine.L= 9 inch.- 22,5 cm Literatur:se Heike Köhler og Katharina Kreschel,Von Störischer Esel zum Kletteraffen Tom.Brandenburger Museumshefte 6,Brandenburg an der Havel 2007. Jürgen & Marianne Clieslik,Ein Jahrhundert Blechspielzeug,München 1981. 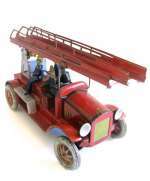 Helmut Schwarz og Marion Faber,Moving Times,Ernst Paul Lehmann Patentwerk,,History on a Toy Factory,Toy Museum Nürnberg 2003. .
Tipp & co tin plate Fire ladder truck with 4 firemen. Germany. 1929. Fire ladder truck lithographed tin from TiPPCO with 4 seated firemen. Open bed truck contains extension ladder on base with leaves,Clockwork activated. This firecar is in a very good condition and all the parts are original.L= 27 cm/10-1/2"inch. Made about 1930. Good working condition.All parts original.